On Thursday morning, The House of Representatives passed H.R. 3823, the Disaster Tax Relief and Airport and Airway Extension Act of 2017, signed by President Trump on Friday last week. The Hurricane Harvey, Irma and Maria employee retention credit for any taxable year is an amount equal to 40 percent of the qualified wages with respect to each eligible employee of such employer for such taxable year. The amount of qualified wages which may be taken into account with respect to any individual shall not exceed $6,000. Allows for emergency tax relief for victims of Hurricanes Harvey, Irma, and Maria. Reauthorizes the Federal Aviation Administration and several aviation programs through March 31, 2018. Reauthorizes Teaching Health Centers and Graduate Medical Education program through March 31, 2018. Requires that federally-backed mortgages must have flood insurance if they are in flood hazard areas and reinforces that private flood insurance counts as valid flood insurance as long as that policy is state-approved. Do you have any questions about WOTC? 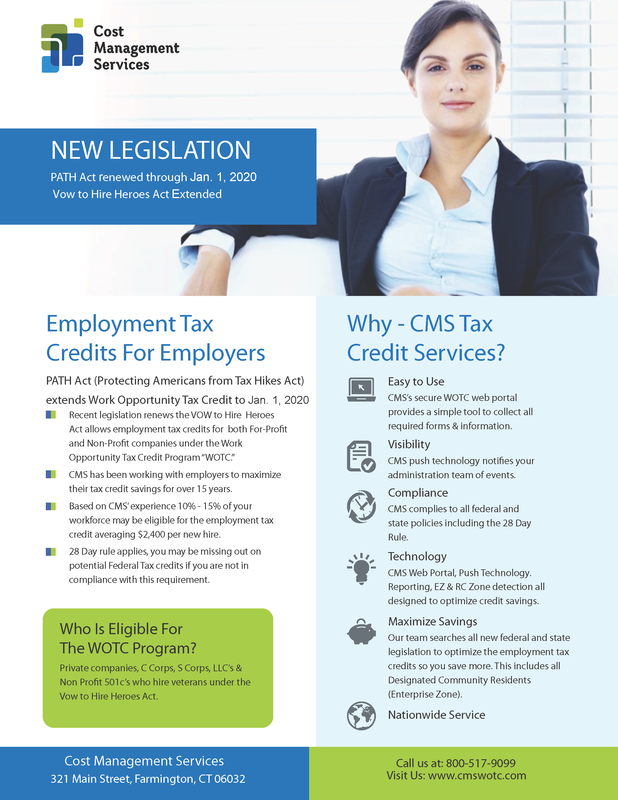 This entry was posted in WOTC News and tagged employee retention credit, H.R.3823 - Disaster Tax Relief and Airport and Airway Extension Act of 2017, hurricane harvey, hurricane irma, hurricane maria, Work Opportunity Tax Credit, WOTC. Bookmark the permalink.